Over the years, there have been many hand weeding tools surfacing in the garden centers of the country. While each company will brag about how wonderful their particular design pulls weeds, most of them do the basic job - pull weeds out of the ground, usually in the lawn. So take your pick from the "prying" tools, the "grab and pull" tools, or even the "flaming" tools. The Rocket Weeder is from a 19th Century weed puller design and Lewis turned it into a modern break-through. They started with the basic idea of a foot plunger and jaws and added an ergonomic handle and a weed ejector handle so your hands never need to get dirty.Now weeding is a simple stand-up job. You just position The Rocket Weeder's jaws over the center of the weed and step on the foot pedal. The jaws grab the root under the ground. Then use the ergonomic handle to rock The Rocket Weeder back toward you. The most stubborn weed slips effortlessly out of the ground. Press the ejector handle and the weed falls harmlessly where you want it. The Original, Effortless Weed Puller: Grandpa's Weeder. Grandpa's pride and joy was his weed puller! A simple lever (and a sore back) was his inspiration for inventing this tool in 1913. He wanted a way to pull out weeds quickly and easily without bending, kneeling, or pulling and by golly, this tool did the trick! Using this tool was so effortless he was often seen using it in his Sunday best! The Bully Tools Weed Bully Home Gardening Tool. This tool is design for ease and comfort, and to keep that yard in pristine shape. With 4-Inch prongs, it can reach deep into the soil to extract the weeds roots and all with no bending over or use of harsh chemicals. Simply push, lift and release. It is made of steel for long life with a protective powder coat finish. All Steel weed extractor with 4-Inch Tines. T Handle with comfort grips. Tool length 33-Inch. The Hound Dog Products "Weed Hound" stand-up weeder pulls weeds by their roots quickly and easily! It requires no bending and no chemicals, making weeding easier both on you and on your garden. The weeder can also be used to aerate soil for a healthier lawn. Like all Hound Dog Products tools, the Weed Hound features durable steel construction and rust-proof finishes for long-lasting wear; its comfortable grips and upright design make gardening easier on your hands, knees, and back. It comes with a limited lifetime warranty. 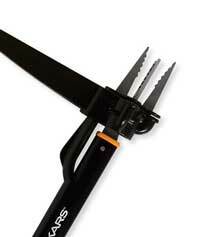 Fiskars UpRoot weed and root remover has longer stainless steel claws that dig deeper and grab more of the root. A lever mechanism at the base of the shaft makes pulling the weeds smooth and easy. Both are attached to a strong yet lightweight aluminum shaft that enables the yardener to stay comfortably upright while removing the root. The yardener simply places the UpRoot weed and root remover directly over the weed, pushes the claws into the ground using the comfortable step, and then easily draws the levered shaft toward him or her. As the shaft is drawn back, the claws close to grip the root and the lever mechanism allows it to be pulled out in one smooth, effortless action. Then the yardener ejects the weed by simply sliding the handle on the weeder's shaft. Nancy hates dandelions and loves the Fiskars UpRoot weed and root remover. It has longer stainless steel claws that dig deeper and grab more of the root. A lever mechanism at the base of the shaft makes pulling broad leaved weeds smooth and easy. Both are attached to a strong yet lightweight aluminum shaft that enables Nancy to stay comfortably upright while removing the root. Nancy simply places the UpRoot weed and root remover directly over the dandelion, pushes the claws into the ground using the comfortable step, and then easily draws the levered shaft toward her. As the shaft is drawn back, the claws close to grip the root and the lever mechanism allows it to be pulled out in one smooth, effortless action. Then, as seen in the photo, she ejects the weed by simply sliding the handle on the weeder's shaft. This tool features a lifetime guarantee and will be available in the spring of 2004 with a suggested retail price of $25. For more information and to find a retailer near you go to www.fiskars.com or call 1-800-500-4849.